Suharto, also spelled Soeharto (June 8, 1921 – January 27, 2008) was an Indonesian military leader, and from 1967 to 1998 the second President of Indonesia. After briefly working as a bank clerk, Suharto joined the Royal Netherlands East Indies Army in 1940. During the Japanese occupation of Indonesia, Suharto served in various Japanese-organized Indonesian security forces. He joined the newly formed Indonesian army during the Indonesian War of Independence, rising through the ranks to command a garrison against Dutch offensives at the Republican capital of Yogyakarta. Following Indonesian independence, Suharto attained the rank of Major General. An attempted coup d'etat on September 30, 1965 was countered by Suharto-led troops. The Suharto-led army blamed the attempt on the Indonesian Communist Party, which was subsequently outlawed, then led a violent anti-communist purge, which is thought to have killed over half a million people. Suharto wrested power from the weakened incumbent and founding president, Sukarno, and was inaugurated President in March, 1968. Popular support as well as military and political support in Indonesia for Suharto's 32-year presidency eroded dramatically following the devastating effect of the 1997–1998 Asian financial crisis on Indonesia's economy and standard of living. He was unopposed for reelection as president for six consecutive elections from 1973 through 1998. Suharto resigned from the presidency in May, 1998 following mass demonstrations and violence. Suharto lived his post-presidential years in near seclusion, and died at 86 years old in Jakarta in 2008. The legacy of Suharto's presidency is debated both in Indonesia and abroad. Under his "New Order" administration, Suharto constructed a strong centralized and military-dominated government. An ability to maintain stability over a sprawling and diverse Indonesia, and an avowedly anti-Communist stance, won him the economic and diplomatic support of the West during the Cold War. For most of his presidency, Indonesia experienced significant economic growth and industrialization. However, he brutally suppressed separatist movements, abused human rights, restricted political parties, banned student protests and maintained only a veneer of democracy. In the years since his presidency, attempts to try him on charges of corruption and genocide failed due to his poor health. On the one hand, Suharto did preside over economic growth. On the other hand, much of this was lost during the 1997 crises, when it proved to be built on shaky foundations. He enriched himself and his family while many Indonesians still experienced poverty. He did nothing to nurture genuine democracy. Suharto was born in the era of Dutch colonial control of Indonesia, in Kemusuk, a part of the larger village of Godean, 15 kilometers west of Yogyakarta, in the Javanese heartland. Like many Javanese, Suharto had only one name. In religious contexts, he is sometimes called “Hajji” or “el-Haj Mohammed Suharto,” but this Islamic title is not part of his formal name or generally used. The spelling "Suharto" has been official in Indonesia since 1947 but the older spelling "Soeharto" is still frequently used. Escaping what was by many accounts a troubled childhood, he enrolled as a soldier in the Dutch military school during a time when the East Indies became a center of several armed conflicts, including World War II and the Indonesian National Revolution. Suharto changed allegiances several times, from the Dutch to the Japanese and then to the Indonesian Nationalists but his training enabled him to become an asset to the side he finally settled upon, that of the Indonesian Nationalists. The facts of Suharto's childhood and youth are, according to Western biographies, steeped in both uncertainty and myth. Standard and apocryphal accounts of his early years and family life exist, many loaded with political meaning. Suharto's parents, his mother Sukirah and father Kertosudiro, were ethnic Javanese and peasant class, living in an area without electricity or running water. His father Kertosudiro's marriage to Sukirah was his second; he already had two children from his previous marriage. Kertosudiro's marriage to Sukirah is believed to have ended in divorce early in Suharto's life; both his parents later remarried. Suharto was estranged from alternately each or both his parents for extended periods of time, being passed around several households for much of his early life. The marriage of his paternal aunt to a low-level Javanese official named Prawirowiharjo, who took to raising Suharto as his own, is believed by biographer Elson (2001) to have provided both a father-figure and role model for Suharto, as well as a stable home in Wuryantoro, from where he received much of his primary education. Suharto boarded with a dukun ("guru") of Javanese mystical arts and faith healing; an experience that deeply affected Suharto who would later, as president, surround himself in "powerful symbolic language". The absence of official documentation and certain aspects of Suharto's early life that are inconsistent with that of a Javanese peasant (Suharto received, for example, an education fairly early on), has led to several rumors of Suharto being the illegitimate child of a well-off benefactor, which included being the child of a Yogyakarta aristocrat or a well-off Chinese Indonesian merchant. Suharto biographer Robert E. Elson believes that such rumors cannot be entirely ruled out, given that much of the information Suharto has given on his origins has been tinged with political meaning. As noted by Elson (2001) and others, Suharto's upbringing stood in contrast with that of leading Indonesian Nationalists such as Sukarno, in that he is believed to have had little interest in anti-colonialism, or political concerns beyond his immediate surroundings. He was also, unlike Sukarno and his circle, illiterate in Dutch or other European languages. He would, however, learn Dutch upon his induction into the Dutch military in 1940. After a brief stint in a clerical job at a village bank (from which he was forced to resign after a bicycle mishap tore his only working clothes), followed by a spell of unemployment, Suharto joined the Royal Netherlands East Indies Army (KNIL) in 1940, and studied in a Dutch-run military school in Gombong near Yogyakarta. With the Netherlands under German occupation and the Japanese pressing for access to Indonesian oil supplies, the ranks of the KNIL had been opened to large intakes of previously excluded Javanese. After graduation, Suharto was assigned to Battalion XIII at Rampal. His service there was unremarkable, but for his contracting malaria requiring hospitalization while on guard duty, and then gaining promotion to sergeant]]. The March 1942 invasion of Imperial Japanese forces was initially welcomed by many Indonesians as a key step towards independence and Suharto was one of thousands of Indonesians who volunteered for Japanese organized security forces. He first joined the Japanese sponsored police force at the rank of keibuho (assistant inspector), where he claimed to have gained his first experience in the intelligence work so central to his presidency. "Criminal matters became a secondary problem," Suharto remarked, "what was most important were matters of a political kind"). Suharto shifted from police work toward the Japanese-sponsored militia, the Peta (Defenders of the Fatherland) in which Indonesians served as officers. In his training to serve at the rank of shodancho (platoon commander) he encountered a localized version of the Japanese bushido, or "way of the warrior," used to indoctrinate troops. This training encouraged an anti-Dutch and pro-nationalist thought, although toward the aims of the Imperial Japanese militarists. The encounter with a nationalistic and militarist ideology is believed to have profoundly influenced Suharto's own way of thinking. The Japanese turned ex-NCOs, including Suharto, into officers and gave them further military education, including lessons in the use of the samurai sword. The Japanese surrender to the Allies in at the end of World War II brought forth the opportunity for the leaders of the Indonesian Nationalist cause Sukarno and Mohammad Hatta to hastily declare the complete independence of Indonesia and the beginning of the Indonesian National Revolution. International recognition of Indonesia's sovereignty, however, would only come after armed action — a task at which Suharto would prove himself adept. The Japanese surrender in 1945 left Suharto in a position to create a name for himself as a part of the military effort to first expel the remaining Japanese forces, and to prepare nationalist forces for the Dutch attempt to retake their former colonial possessions in the archipelago. He became a deputy to Umar Slamet in the service of the revolutionary government's People's Security Body (BKR). Suharto claims to have led a number of attacks against remaining Japanese forces around Yogyakarta. The central role he commonly portrayed himself playing in his reminisces on the period during his presidency is debatable; however, it may be acknowledged that Suharto's familiarity with military functioning helped in the organization of the disparate independence forces into a unified fighting force. In the early years of the War, Suharto organized local armed forces into Battalion X of Regiment I; Suharto was promoted to the rank of Major and became Battalion X's leader. The arrival of the Allies, under a mandate to return the situation to the status quo ante bellum, quickly led to clashes between Suharto's Division X and returning Dutch forces, bolstered by Gurkhas in the employ of Great Britain. Political differences within both the Allies and the civilian Nationalist forces caused the conflict to alternate in intensity from the end of 1945 into first months of 1946, as negotiations went on between the leaderships of the Indonesian Nationalists and the Dutch in between periods of fighting. In this muddle, Suharto led his troops toward halting an advance by the Dutch T ("Tiger") Brigade on May 17, 1946. It earned Suharto the respect of his superior, Lieutenant Colonel Sunarto Kusumodirjo, who invited him to draft the working guidelines for the Battle Leadership Headquarters (MPP), a body created to organize and unify the command structure of the Indonesian Nationalist forces. The military forces of the still infant Republic of Indonesia were constantly restructuring. By August 1946, Suharto was head of the 22nd Regiment of Division III (the "Diponegoro" Division) stationed in Yogyakarta. In late 1946 the Diponegoro Division became responsible for defense of the west and south-west of Yogyakarta from Dutch forces. Conditions at the time are reported in Dutch sources as miserable; Suharto himself is reported as assisting smuggling syndicates in the transport of opium through the territory he controlled, in order to make income. Operatie Kraai ("Operation Crow"), commenced in December 1948 and decimated much of the Indonesian fighting forces, resulting in the capture of Sukarno and Hatta, the civilian leadership of Indonesia. Suharto, for his part, took severe casualties as the Dutch invaded the area of Yogyakarta; the retreat was equally humiliating. It is widely believed that the humiliating nature of this defeat ingrained a sense of guilt in Suharto, as well as a sense of obligation to avenge his honor. Suharto, and the aggrieved Indonesian armed forces, attempted to do this by means of ]]guerrilla warfare, using intelligence and supply networks established at the village level. During this time ambushes became a favored tactic; villagers were enlisted to attack Dutch patrols with weapons as primitive as bamboo spears. The desired effect was to remind the populace of the continuing resistance to Dutch rule. However, these attacks were largely ineffective and were often comparable to suicide. Suharto's efforts to regain the national honor culminated in an attack on Dutch forces at Yogyakarta on March 1, 1949. Suharto would later embellish his role as the singular plotter; according to more objective sources, however, the nationalist Sultan Hamengku Buwono IX (who still remained in power), as well as the Panglima of the Third Division ordered the attack. General Nasution would recall, however, that Suharto took great care in preparing the "General Offensive" (Indonesian" Serangan Umum). In a series of daring small-scale raids under cover of darkness and with the support of locals, Suharto's forces captured the city, holding it until noon. The attack yielded some ammunition and a few light arms; as propaganda and psychological warfare it had filled the desired effect, however — civilians sympathetic to the Nationalist cause within the city had been galvanized by the show of force, and internationally, the United Nations took notice, with the Security Council putting pressure on the Dutch to cease Police Action and to re-embark on negotiations. Suharto gained both national and international recognition of his abilities as a military planner. The return of the Dutch to the negotiating table all but assured, Suharto took an active interest in the peace agreements, though they were much to his dissatisfaction. As war ended, Suharto married Siti Hartinah (known as Madam Tien), a woman from a high class family that, in the years of the revolution, lost its prestige and income. Over the next 17 years the couple would have six children: Siti Hardiyanti Rukmana (Tutut, born 1949), Sigit Harjojudanto (born 1951), Bambang Trihatmodjo (born 1953), Siti Hediati (Titiek, born 1959), Hutomo Mandala Putra (Tommy, born 1962), and Siti Hutami Endang Adiningsih (Mamiek, born 1964). Suharto's wife, died in 1996. It was an arranged marriage. McDonald says that Tien flair for business, in which it "was accepted that in hard times a wife might indulge in genteel commerce to augment the family budget," a "trait carried to her children and grandchildren," became "the Achilles heel of Soeharto's presidency." During the following years he served in the Indonesian National Army, stationed primarily on Java. In 1950, Colonel Suharto led the Garuda Brigade in suppressing a rebellion of largely Ambonese colonial-trained supporters of the Dutch-established State of Eastern Indonesia and its federal entity the United States of Indonesia; the rebellion was led by Andi Azis a former officer of the Royal Netherlands East Indies Army (KNIL). During his one-year stay in Makassar, Suharto became acquainted with his neighbors the Habibie family, whose eldest son BJ Habibie would later became Suharto's vice-president and went on to succeed him as President. In 1951, Suharto led his troops in a cautious blocking campaign against the Islamic-inspired rebellion of Battalion 426 in Central Java before it was broken by the 'Banteng (Wild Buffalo) Raiders' led by Ahmad Yani. Between 1954 and 1959, Brigadier General Suharto served in the important position of commander of Diponegoro Division, responsible for Central Java and Yogyakarta provinces. His relationship with prominent businessmen Liem Sioe Liong and Bob Hasan began in Central Java where he was involved in series of 'profit generating' enterprises conducted primarily to keep the poorly funded military unit functioning Army anti-corruption investigations implicated Suharto in 1959 smuggling scandal. However, his military career was rescued by Gen. Gatot Subroto; instead of being brought before a court martial, he was transferred to the army Staff College in Bandung, West Java. In 1962 he was promoted to the rank of major general and was appointed to lead the Mandala Command, a joint army-navy-air force umbrella command headquartered in Makassar, that organized military incursions in Netherlands New Guinea, after this country had elected a council and adopted a flag and anthem in preparation of independence. Diplomatic pressure by the US, which feared Indonesia would otherwise ally with the Soviet Union, led the Netherlands to sign the New York Agreement that transferred sovereignty of Western New Guinea to Indonesia. After this, Suharto was appointed commander of Kostrad (Strategic Reserve), a sizeable army combat force, which most importantly had significant presence in the Jakarta area. Described as the great dalang ("puppet master"), President Sukarno's position came to depend on balancing the opposing and increasingly hostile forces of the army and Communist Party of Indonesia (PKI). His anti-imperial ideology saw Indonesia increasingly dependent on the Soviet Union and then communist China. By 1965, the PKI penetrated all levels of government extensively, and with the support of Sukarno and the air force, successfully pursued policies to gain influence at the expense of the army, thus ensuring the army's enmity. By late 1965, the army was divided between a left-wing faction allied with the PKI, and a right-wing faction that were being courted from abroad by the United States. On the night of September 30–October 1, 1965 six senior army generals were kidnapped and executed in Jakarta by a battalion of soldiers from the Presidential Guard in an attempted coup. The left faction among the top generals was wiped out, including the powerful Army Chief of Staff, Ahmad Yani. The army thus fell to those more willing to stand up to Sukarno and the army's enemies on the left. Backed by elements of the armed forces, the insurgents, known as the 30 September Movement, commanded the Presidential Palace opposite Merdeka Square, the national radio station, and telecommunications centre. The group announced on radio that morning that they were trying to stop a CIA-backed military coup which was planned to remove Sukarno from power on "Army Day," October 5. Suharto was the most senior general not removed by the 30 September group, apart from Armed Forces Chief of Staff, General Abdul Harris Nasution (who was targeted for assassination but narrowly escaped, and was in hiding). Suharto had no affinity to Sukarno, nor any special Islamic conviction with which to oppose him. He despised disorder, but was known for prizing opportunity, for which General Yani and disciplined him several years before, thus removing affinity there. On the night of 30 September, Suharto had been in hospital preoccupied with a scalding injury to his three-year old son Tommy where Colonel Abdul Latief was the only principal of ensuing events with whom Suharto spoke that evening. Upon being told of the disappearance of the generals and shootings, Suharto went to Kostrad headquarters just before dawn from where he could see soldiers occupying Merdeka Square. He led the elite Army Strategic Reserve (Kostrad) in seizing control of the center of Jakarta, capturing key strategic sites. Now joined by Nasution, Suharto announced over the radio at 9:00 P.M. that six generals had been kidnapped by "counter-revolutionaries" and that he was in control of the army, and would crush the 30 September Movement and safeguard Sukarno. Suharto issued an ultimatum to Halim Air Force Base, where the G30S had based themselves and where Sukarno (the reasons for his presence are unclear and were subject of claim and counter-claim), General Omar Dhani and Aidit had gathered. The coup leaders fled Jakarta while G30S-sympathetic battalions in Central Java quickly came under Suharto control, and it was clear that the incompetently organized and poorly coordinated coup had failed. By October 2, Suharto's faction was firmly in control of the army. Sukarno's obedience to Suharto's October 1 ultimatum to leave Halim is seen as changing all power relationships. Sukarno's fragile balance of power between the military, political Islam, communists, and nationalists that underlay his "Guided Democracy" was now collapsing. In early October, a military propaganda campaign began to sweep the country, successfully convincing both Indonesian and international audiences that it was a Communist coup, and that the murders were cowardly atrocities against Indonesian heroes. The PKI's denials of involvement had little effect. The army led campaign to purge Indonesian society, government and armed forces of the communist party and other leftist organizations. Leading PKI members were immediately arrested, some summarily executed. The purge quickly spread from Jakarta to the rest of the country, and the worst massacres were in Java and Bali. The situation varied across the country; in some areas the army organized civilian groups and local militias, in other areas communal vigilante action preceded the army. The most widely accepted estimates are that at least half a million were killed. A CIA study of the events in Indonesia assessed that "In terms of the numbers killed the anti-PKI massacres in Indonesia rank as one of the worst mass murders of the twentieth century." Many others were also imprisoned and for the next ten years people were still being imprisoned as suspects. It is thought that as many as 1.5m were imprisoned at one stage or another. As a result of the purge, one of Sukarno's three pillars of support, the Indonesian Communist Party, had been effectively eliminated by the other two, the military and political Islam. By January 1966, President Sukarno's strongest pillar of support had been effectively eliminated, largely by his other two pillars of power, the army and the Muslims. Long wanting to more control of the political system, the army now saw its opportunity to occupy the apex of Indonesian power. Sukarno was still the Supreme Commander by virtue of the constitution, thus Suharto was careful not to be seen to be seizing power in his own coup. For 18 months following the quashing of the 30 September Movement, there was a complicated process of political maneuvers against Sukarno, including student agitation, stacking of parliament, media propaganda and military threats. On February 1, 1966, Pres. Sukarno promoted Suharto to the rank of Lieutenant General. The same month, Gen. Nasution had been forced out of his position of Defense Minister. The power contest had been boiled down to Suharto and Sukarno; with Sukarno in ill-health and politically isolated due to the removal of the PKI from the scene, Suharto had virtually assured himself the presidency. The Supersemar decree of March 11, 1966 transferred much of Sukarno's power over the parliament and army to Suharto, ostensibly allowing Suharto to do whatever was needed to restore order. On March 12, 1967 Sukarno was stripped of his remaining power by Indonesia's provisional Parliament, and Suharto named Acting President. Sukarno was placed under house arrest and little more was heard from him, and he died in June 1970. 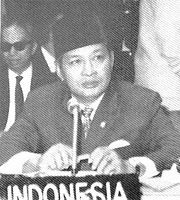 On March 21, 1968, the Provisional Peoples Representative Assembly formally elected Suharto for the first of his five-year terms as President. Suharto established what he called the "New Order" (Orde Baru). In place of Sukarno's revolutionary rhetoric, Suharto showed a pragmatic use of power, and in contrast to the liberal parliamentary democracy of the 1950s, Suharto headed an authoritarian, military-dominated government. Economic development and the building of strong government with a resultant weak civil society became defining features of the New Order. Suharto has been accused of systematic human rights abuses, "including media censorship, tight restrictions on freedom of association and assembly, a highly politicized and controlled judiciary, widespread torture, attacks on the rights of minorities, massacres of alleged communists, and numerous war crimes committed in East Timor, Aceh, Papua and the Moluccan islands. He also presided over a famously corrupt regime in which he, his family, and his cronies amassed billions of dollars in illegal wealth – funds which could have addressed Indonesia’s widespread poverty and social problems. Internationally, Suharto put Indonesia on a course toward improved relations with Western nations, while ending its friendly relations with the People's Republic of China. He dispatched his foreign minister, Adam Malik to mend strained relations with the United States, United Nations, and Malaysia and end the Indonesia-Malaysia confrontation. Indonesia also became a founding member of ASEAN. Diplomatic ties with the People's Republic of China were eventually restored in 1990. To maintain domestic order, Suharto greatly expanded the funding and powers of the Indonesian state apparatus. He established two intelligence agencies—the Operational Command for the Restoration of Security and Order (KOPKAMTIB) and the State Intelligence Coordination Agency (BAKIN)—to deal with threats to the regime. Suharto also established the Bureau of Logistics (BULOG) to distribute rice and other staple commodities granted by USAID. These new government bodies were put under the military regional command structure, that under Suharto was given a "dual function" as both a defense force and as civilian administrators. Suharto became a strong advocate for Chinese assimilation rather than integration. As part of the 1967 'Basic Policy for the Solution of the Chinese Problem' and other measures, all but one Chinese-language papers were closed, all Chinese religious expressions had to be confined to their homes, Chinese-language schools were phased out, Chinese script in public places was banned, and Chinese were encouraged to take on Indonesian-sounding names. Most of this legislation was revoked following Suharto's fall from power in 1998. President Suharto relied on a group of American-educated economists, nicknamed the "Berkeley Mafia," to set economic policy. Soon after coming to power, he passed a number of economic reforms meant to establish Indonesia as a center of foreign investment. These included the privatization of its natural resources to promote investment by industrialized nations, labor laws favorable to multinational corporations, and soliciting funds for development from institutions including the World Bank, Western banks, and friendly governments. Suharto brought a shift in policy from firebrand Sukarno that allowed for USAID and other relief agencies to resume operations within the country. Suharto would open Indonesia's economy by divesting state owned companies, and Western nations in particular were encouraged to invest and take control of many of the mining and construction interests in Indonesia. However, the environmental implications and consequences of exploiting natural resources were never considered. Within a few years, the Indonesian economy was revived from its near collapsed state of the mid-1960s. It grew by an average 7 percent for 25 years, reducing the proportion of Indonesians in the "very poor" category from 65 percent in the mid-1960s to 7 percent in 1990. Many Indonesians, however, were still poor and much of the economic growth depended on cheap labor. Most of these gains, too, would be lost in the 1997/1998 Asian financial crisis, however. Suharto established Indonesian self-sufficiency in rice production by the mid-1980s, extended basic education to almost all citizens and implemented a successful family planning program. As virtually unchecked forces in Indonesian society under the New Order, however, members of the military and Golkar Party were heavily involved as intermediaries between businesses (foreign and domestic) and the Indonesian government. This led to bribery, racketeering, and embezzlement. Funds from these practices often flowed to foundations (yayasan) controlled by the Suharto family. From his assumption of office until his resignation, Suharto continued Sukarno's policy of asserting Indonesian sovereignty. He acted zealously to stake and enforce territorial claims over much of the region, through both diplomacy and military action. In 1969, Suharto moved to end the longtime controversy over the last Dutch territory in the East Indies, Western New Guinea. Working with the United States and United Nations, an agreement was made to hold a referendum on self-determination, in which participants could choose to remain part of the Netherlands, to integrate with the Republic of Indonesia, or to become independent. Though originally phrased to be a nationwide vote of all adult Papuans, the "Act of Free Choice" was held July–August 1969 allowed only 1022 "chiefs" to vote. The unanimous vote was for integration with the Republic of Indonesia, leading to doubts of the validity of the vote. In 1975, after Portugal withdrew from its colony of East Timor and the Fretilin movement momentarily took power, Suharto ordered troops to invade East Timor. Later the puppet government installed by Indonesia requested the area be annexed to the country. A detailed statistical report prepared for the Commission for Reception, Truth and Reconciliation in East Timor estimated a minimum of 102,800 conflict-related deaths in the period 1974–1999, namely, approximately 18,600 killings and 84,200 'excess' deaths from hunger and illness. On July 15, 1976 Suharto's "New Order" declared East Timor the 27th province of Indonesia. Following Suharto's 1998 resignation from the Presidency, East Timor voted for independence in 1999 and was transferred to United Nations administration. In 1976, the regime was challenged in the province of Aceh by the formation of the Free Aceh Movement, or GAM, which demanded independence from the unitary state. Suharto quickly authorized troops to put down the rebellion, forcing several of its leaders into exile in Sweden. Prolonged fighting between GAM and the Indonesian military and police led Suharto to declare martial law in the province, by naming Aceh a "military operational area" (DOM) in 1990. The rapid pace of this development had vastly increased their population density. In response, Suharto pursued the policy of transmigration to promote movement from crowded cities to rural regions of the archipelago where natural resources had not yet been exploited. Suharto with U.S. Secretary of Defense William Cohen, January 14, 1998. In 1970, corruption prompted student protests and an investigation by a government commission. Suharto responded by banning student protests, forcing the activists underground. Only token prosecution of the cases recommended by the commission was pursued. The pattern of co-opting a few of his more powerful opponents while criminalizing the rest became a hallmark of Suharto's rule. In order to maintain a veneer of democracy, Suharto made a number of electoral reforms. According to his electoral rules, however, only three parties were allowed to participate in the election: his own Golkar party; the Islamist United Development Party (PPP); and the Indonesian Democratic Party (PDI). All the previously existing political parties were forced to be part of either the PPP and PDI, with public servants under pressure to join Golkar. In a political compromise with the powerful military, he banned its members from voting in elections, but set aside 100 seats in the electoral college for their representatives. As a result, he was unopposed for reelection as president in 1973, 1978, 1983, 1988, 1993, and 1998. The BBC noted, though, that "his success at the polls was unsurprising as electoral laws limited the number of parties and stifled opposition". The military wielded enormous political power in this system. It has been accused of "systematic rapes, disappearances, torture, and extrajudicial killings" on Suharto's behalf. On May 5, 1980 a group of prominent military men, politicians, academics and students calling themselves the "Petition of Fifty" questioned Suharto's use of the national ideology Pancasila. The Indonesian media suppressed the news and the government placed restrictions on the signatories. After the group's 1984 accusation that Suharto was creating a one-party state, some of its leaders were jailed. After the 1990s brought end of the Cold War, Western concern over communism waned, and Suharto's human rights record came under greater international scrutiny. The 1991 killing of over 200 East Timorese civilians in Dili, East Timor, resulted in the Congress of the United States passing limitations on IMET assistance to the Indonesian military. In 1993, under President Bill Clinton, the U.S. delegation to the UN Human Rights Commission helped pass a resolution expressing deep concern over Indonesian human rights violations in East Timor. Noam Chomsky has referred to the Indonesian invasion and occupation of East Timor has the worst instance of genocide relative to population since the Holocaust. In 1996 Suharto was challenged by a split over the leadership of the Indonesian Democratic Party (PDI), a legal party that propped up the regime. Megawati Sukarnoputri, the daughter of Sukarno, had become PDI's chairwoman and was increasingly critical of Suharto's regime. In response, Suharto backed a co-opted faction led by Deputy Speaker of Parliament Suryadi. The Suryadi faction announced a party congress to sack Megawati would be held in Medan from June 20 - June 22. In response, Megawati proclaimed that if sacked, her supporters would hold demonstrations in protest. The Suryadi faction went through with its sacking of Megawati, and the demonstrations manifested themselves throughout Indonesia. This led to several confrontations on the streets between protesters and security forces. A deal was eventually made with the military to allow Megawati's supporters to take over PDI headquarters in Jakarta, in exchange for a pledge of no further demonstrations. During this time, Megawati supporters organized "democracy forums" at the site, with several activists making speeches denouncing Suharto and his regime. After one month of this, police, soldiers, and persons claiming to be Suryadi supporters stormed the headquarters, killing Megawati supporters and arresting two-hundred. Those arrested were tried under the Anti-Subversion and Hate-spreading laws. The day would become known as "Black Saturday" and mark the beginning of a renewed crackdown by the New Order government against supporters of democracy, now called the "Reformasi" or Reformation. The 1997 Asian Financial Crisis had dire consequences for the Indonesian economy and society, and Suharto's regime. The Indonesian currency, the rupiah, took a sharp dive in value. There was a "run on the banks as people rushed to take out rupiahs before the currency could depreciate even further in value." "Shops were stripped of their goods," too, "as panic-buying affected the whole country." As the poor took to the streets, protests and riots create general disorder. Suharto now came under scrutiny from international lending institutions, chiefly the World Bank, IMF and the United States, over longtime embezzlement of funds and some protectionist policies. In December, Suharto's government signed a letter of intent to the IMF, pledging to enact austerity measures, including cuts to public services and removal of subsidies, in return for receiving the aid of the IMF and other donors. Beginning in early 1998, the austerity measures approved by Suharto had started to erode domestic confidence in the regime. Prices for commodities such as kerosene and rice, and fees for public services including education rose dramatically. The effects were exacerbated by widespread corruption. 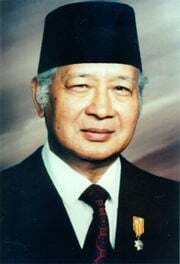 Suharto stood for reelection for the seventh time in March 1998, justifying it on the grounds of the necessity of his leadership during the crisis. As in past years, he was unopposed for reelection. This sparked protests and riots throughout the country, now termed the Indonesian Revolution of 1998. Dissension within the ranks of his own Golkar party and military finally weakened Suharto, and on May 21, 1998 he stood down from power. He was replaced by his deputy Jusuf Habibie. After his resignation, Suharto retired to a family compound in Central Jakarta, making few public appearances. Efforts to prosecute Suharto have mostly centered around alleged mismanagement of funds, and their force has been blunted due to health concerns. Suharto was never prosecuted. In May 1999, a TIME Asia estimated Suharto's family fortune at US$15 billion in cash, shares, corporate assets, real estate, jewelry and fine art. Of this, US$9 billion is reported to have been deposited in an Austrian bank. The family is said to control about 36,000 km² of real estate in Indonesia, including 100,000 m² of prime office space in Jakarta and nearly 40 percent of the land in East Timor. Over US$73 billion is said to have passed through the family's hands during Suharto's 32-year rule. On May 29, 2000, Suharto was placed under house arrest when Indonesian authorities began to investigate the corruption during his regime. In July 2000, it was announced that he was to be accused of embezzling US$571 million of government donations to one of a number of foundations under his control and then using the money to finance family investments. But in September court-appointed doctors announced that he could not stand trial because of his declining health. State prosecutors tried again in 2002 but then doctors cited an unspecified brain disease. According to Transparency International, Suharto embezzled more money than any other world leader in history with an estimated US $15–35 billion embezzlement during his 32 years rule. On March 26, 2008, civil court judge Wahyono acquitted Suharto of corruption but ordered his charitable foundation Supersemar to pay $110m (£55m). Unable to legally prosecute Suharto, the state has instead pursued legal actions against his former subordinates and members of his family. Suharto's son Hutomo Mandala Putra, more widely known as Tommy Suharto, was initially sentenced to 15 years in jail for arranging the murder of a judge who sentenced him to 18 months for his role in a land scam in September 2000. He became the first member of the Suharto family to be found guilty and jailed for a criminal offence. Tommy Suharto maintained his innocence, and won a reduction of his sentence to ten years in June 2005. On October 30, 2006, he was freed on "conditional release." In 2003, Suharto's half-brother Probosutedjo was tried and convicted for corruption and the loss of $10 million from the Indonesian state. He was sentenced to four years in jail. He later won a reduction of his sentence to two years, initiating a probe by the Indonesian Corruption Eradication Commission into the alleged scandal of the "judicial mafia" which uncovered offers of $600,000 to various judges. Probosutedjo confessed to the scheme in October 2005, leading to the arrest of his lawyers. His full four year term was reinstated. After a brief standoff at a hospital, in which he was reportedly protected by a group of police officers, he was arrested on November 30, 2005. On July 9, 2007, Indonesian prosecutors filed a civil lawsuit against former President Suharto, to recover state funds ($440m or £219m, which allegedly disappeared from a scholarship fund, and a further $1.1 billion in damages). On September 4, 2007, mediation at the Attorney General's Office (AGO) between prosecutors and lawyers for Suharto over the Supersemar foundation civil lawsuit succeeded and thus the trial will have to commence. On September 10, 2007, Indonesia's Supreme Court awarded Suharto damages against TIME Asia magazine]], ordering it to pay him one trillion rupiah]] ($128.59 million). The High Court reversed the judgment of an appellate court and Central Jakarta district court (made in 2000 and 2001). Suharto had sued the U.S.-based TIME magazine seeking more than $US 27 billion in damages for libel over a 1999 article which reported that he transferred stolen money abroad. After resigning from the presidency, Suharto was hospitalized repeatedly for stroke, heart, and intestinal problems. His declining health negatively affected the many attempts to prosecute Suharto on charges of corruption and human rights violations, as his lawyers successfully claimed that his condition rendered him unfit for trial. On May 6, 2005, Suharto was taken to Pertamina Hospital in Jakarta with intestinal bleeding, believed to be from diverticulosis. The political elite of Indonesia, including President Susilo Bambang Yudhoyono and Vice President Jusuf Kalla, visited his bedside. He was released and returned home, May 12, 2005. On May 26, 2005, the Jakarta Post reported that amid an effort by the government of President Susilo Bambang Yudhoyono to crack down on corruption, Indonesian Attorney General Abdurrahman Saleh appeared before a Parliamentary commission to discuss efforts to prosecute New Order figures, including Suharto. Attorney General Abdurrahman remarked that he hoped Suharto could recover so that the government could begin inquiries into New Order human rights violations and corruption for purposes of compensation and recovery of state funds, but expressed skepticism that this would be possible. As a result, the Supreme Court of Indonesia has issued a decree making the office of the Attorney General responsible for supervising Suharto's medical care. On April 24, 2006, Attorney General Abdurrahman announced that a team of 20 doctors would be asked to evaluate Suharto's health and fitness for trial. One physician, Brigadier General Dr. Marjo Subiandono, stated his doubts about by noting that "[Suharto] has two permanent cerebral defects." In a later Financial Times report, Attorney General Abdurrahman discussed the re-examination, and called it part of a "last opportunity" to prosecute Suharto criminally. Attorney General Abdurrahman left open the possibility of filing suit against the Suharto estate." On May 4, 2006, Suharto was again admitted to Pertamina Hospital for intestinal bleeding. His doctors stated further that Suharto was suffering from partial organ failure and in unstable condition. On January 4, 2008, Suharto, 86, was rushed to the Pertamina hospital, Jakarta with complications arising from a weak heart, swelling of limbs and stomach, and partial renal failure. His health fluctuated for several weeks but progressively worsened with anemia and low blood pressure due to heart and kidney complications, internal bleeding, fluid on his lungs, and blood in his feces and urine which caused a hemoglobin drop. Doctors reported his "very critical condition" after almost all his organ functions failed, and that there was only a 50-50 chance that he would survive, though some Indonesians believed Suharto would not die easily because he practiced Kejawen mysticism. On January 23, 2008 Suharto's health worsened further, as a sepsis infection spread through his body. His family consented to the removal of life support machines, and he died on January 27 at 1:10 P.M. local time. Suharto's body was taken from Jakarta to the Giri Bangun mausoleum complex, part of the Mangkunegaran burial site in Karanganyar, near the Central Java city of Solo. He was buried alongside his late wife in a state military funeral with full honors, with the Kopassus elite forces and Kostrad commandos as the honor guard and pallbearers and Commander of Group II Kopassus Surakarta Lt. Colonel Asep Subarkah. In attendance were the incumbent president, Susilo Bambang Yudhoyono as "Ceremony Inspector," and vice-president, government ministers, and armed forces chiefs of staff. Suharto's eldest daughter Siti Hardiyanti Rukmana spoke at the funeral requesting, in accordance with Javanese custom, forgiveness for her any misdoings of her father. Tens of thousands of people lined the streets to see the convoy. Condolences were offered by many regional heads of state, although certain regional leaders such as Helen Clark boycotted the funeral, and Indonesia's President Susilo Bambang Yudhoyono declared a week of official mourning. Suharto argued that a young nation needs a strong leader to guide it towards economic self-reliance. This is similar to the ideology of many fascist dictators. Styled the "the greatest kleptocrat of all time," despite his three decades in power, his legacy is in the main remembered as one of oppression, self-enrichment and indifference towards the welfare of the people over whom he exercised power. Indonesia did experience economic growth under his rule but this failed to benefit the many, due to nepotism, corruption and failure to establish "political, social, legal, and environmental safeguards." Instead, raw materials were exploited without regard to ecological consequences while Suharto policy of population transfer "fostered destructive … inter-ethnic and religious violence." Much economic growth, too, was built on the back of low-paid labor. Abrash says that "a 1997 World Bank report estimated that at least 20-30 percent of Indonesian government development funds were diverted through informal payments to government personnel and politicians, while a high level of “leakage” went to the ruling political faction, GOLKAR, and senior government officials. "Abrash says that 30 years of economic gain has been wiped out, and "Observers predict that Indonesia will remain a “black hole” economically, politically, and strategically for the next decade." Suharto did not serve his country's but his own interests. Yet for almost all of his presidency, Suharto was regarded as an ally by the USA and other Western powers. Partly, they supported him because they were unprepared to deal with the possible disintegration of Indonesia as a unitary state. They therefore turned their back on "government's repressive practices while consistently identifying Indonesia as a model of economic development success." Abrash suggests that instead of supporting "sectors that maintain the political and economic status quo in Indonesia: the government, the military, and the corporate sector" as it has in the past, the US and other powers ought to focus on nurturing a strong civil society and increased "political participation" and "enhanced local autonomy" and on curbing the power of the military. ↑ 1.0 1.1 1.2 Hamish McDonald, 2008. No End to Ambition. Sydney Morning Herald Retrieved September 7, 2008. ↑ R.E. Elson. 2001. Suharto: a political biography. (Cambridge, UK: Cambridge University Press. ISBN 9780521773263), 1–6. ↑ M. Oudang. 1954. Perkembangan kepolisian di Indonesia. (Jakarta, ID: Mahabarata), 36. ↑ M.C. Ricklefs. 1993. A history of modern Indonesia, c. 1300 to the present. (Stanford, CA: Stanford University Press. ISBN 97808047219430, 282. ↑ Adrian Vickers. 2005. A history of modern Indonesia. (Cambridge, UK: Cambridge University Press. ISBN 9780521834933), 156. ↑ Theodore Friend. 2003. Indonesian destinies. (Cambridge, MA: Belknap Press of Harvard University Press. ISBN 9780674011373), 104. ↑ Ricklefs, 288; Friend, 113; Vickers, 159. ↑ George McTurnon Kahin and Audrey R. Kahin. 1995. Subversion as Foreign Policy: The Secret Eisenhower and Dulles Debacle in Indonesia. (New York, NY: The New Press. ISBN 9781565842441), 227. ↑ Adam Schwarz. 1999. A Nation in Waiting: Indonesia's Search for Stability. (Boulder, CO: Westview Press. ISBN 9780813336497), 2 and 22. ↑ Indonesia: Suharto’s Death a Chance for Victims to Find Justice: Government Should Investigate Crimes of Former Dictator’s Regime. Human Rights News. Retrieved September 7, 2008. ↑ Brendan Koerner, 2004, How Did Suharto Steal $35 Billion? Cronyism 101. Slate.com. Retrieved September 7, 2008. ↑ Brad Simpson, 2004, Indonesia's 1969 Takeover of West Papua Not by "Free Choice". The National Security Archive. Retrieved September 7, 2008. ↑ The Profile of Human Rights Violations in Timor-Leste, 1974–1999. A Report to the Commission on Reception, Truth and Reconciliation of Timor-Leste Benetech Human Rights Data Analysis Group. Retrieved September 7, 2008. ↑ 48.0 48.1 48.2 Obituary: Ex-President Suharto of Indonesia. BBC News. Retrieved September 7, 2008. ↑ 49.0 49.1 49.2 Abigail Abrash, 1998, Indonesia After Suharto. Foreign Policy in Focus 3:34. Retrieved September 7, 2008. ↑ H.AMDT.647 (A003): An amendment to prohibit any funds appropriated in the bill to be used for military education and training assistance to Indonesia. THOMAS (Library of Congress). Retrieved September 7, 2008. ↑ Situation in East Timor: Commission on Human Rights resolution 1993/97. UN High Commissioner for Human Rights. Retrieved September 7, 2008. ↑ Frida Berrigan, October 2001, Indonesia at the Crossroads: U.S. Weapons Sales and Military Training: A Special Report. The Invasion of East Timor. Arms Trade Resource Center, World Policy Institute. Retrieved September 7, 2008. ↑ Ed Aspinall, What happened before the riots? Inside Indonesia 48. (October-December 1996). Retrieved September 7, 2008. ↑ Suharto tops corruption rankings. BBC News. Retrieved September 7, 2008. ↑ Suharto charity told to pay $110m. BBC News. Retrieved September 7, 2008. ↑ Tommy Suharto Freed From Prison. BBC News. Retrieved September 7, 2008. ↑ Civil suit filed against Suharto. BBC News. Retrieved September 7, 2008. ↑ Suharto wins $128m in damages. Herald Sun. Retrieved September 7, 2008. ↑ Former Indonesian dictator unfit to stand trial - doctor. The Sydney Morning Herald. Retrieved September 7, 2008. ↑ Shawn Donnan, 2006. Jakarta makes final attempt to pursue Suharto charges. Financial Times Retrieved September 7, 2008. ↑ [Suharto's condition is 'unstable.] BBC News, May 5, 2006. Retrieved September 7, 2008. ↑ Indonesia's ailing Suharto 'getting worse': doctors. Arab Times Retrieved September 7, 2008. ↑ Suharto condition 'deteriorating.' BBC News. Retrieved September 7, 2008. ↑ Indonesia ex-leader Suharto dies. BBC News. Retrieved September 7, 2008. ↑ Jason Tedjasukmana, 2008. Indonesia Bids Farewell to Suharto. TIME. Retrieved September 7, 2008. ↑ NZ won't sign Suharto condolence book. Herald Sun Retrieved September 05, 2008. ↑ Geoff Thompson, 2008. Suharto's body arrives home. ABC News (Australia). Retrieved September 7, 2008. Elson, R.E. 2001. Suharto: a political biography. Cambridge, UK: Cambridge University Press. ISBN 9780521773263. Friend, Theodore. 2003. Indonesian destinies. Cambridge, MA: Belknap Press of Harvard University Press. ISBN 9780674011373. Kahin, George McTurnon, and Audrey R. Kahin. 1995. Subversion as Foreign Policy: The Secret Eisenhower and Dulles Debacle in Indonesia. New York, NY: The New Press. ISBN 9781565842441. McDonald, Hamish. 1980. Suharto's Indonesia. Blackburn, AU: Fontana. ISBN 9780006357216. Oudang, M. 1954. Perkembangan kepolisian di Indonesia. Jakarta, ID: Mahabarata. Ricklefs, M.C. 1993. A history of modern Indonesia, c. 1300 to the present. Stanford, CA: Stanford University Press. ISBN 9780804721943. Schwarz, Adam. 1999. A Nation in Waiting: Indonesia's Search for Stability. Boulder, CO: Westview Press. ISBN 9780813336497. McGlynn, John H. 2007. Indonesia in the Soeharto years: issues, incidents and images. Jakarta: Lontar. ISBN 9789067182638. Vatikiotis, Michael R.J. 1993. Indonesian politics under Suharto: order, development, and pressure for change. (Politics in Asia series.) London, UK: Routledge. ISBN 9780415082808. Vickers, Adrian. 2005. A history of modern Indonesia. Cambridge, UK: Cambridge University Press. ISBN 9780521834933.
news.bbc.co.uk, Life in pictures: Indonesia's Suharto — The pictures of Suharto in BBC. This page was last modified on 26 October 2015, at 14:27.